Here’s a cool trick to make odd-count peyote as easy as even-count peyote. String the first two rows (beads 1-5). String the first bead in the next row (bead 6) and work peyote stitches back towards the tail (bead 7). Pass on a diagonal through the last two beads in the previous row (beads 2 and 1). 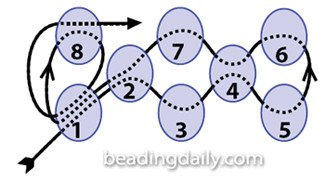 String the first bead in the next row (bead 8) and simply loop around through the bead below (bead 1), exiting through the bead just added (bead 8). That’s it! Continue in peyote, making this loop turn to connect the new bead each time you return to the tail end of a row.